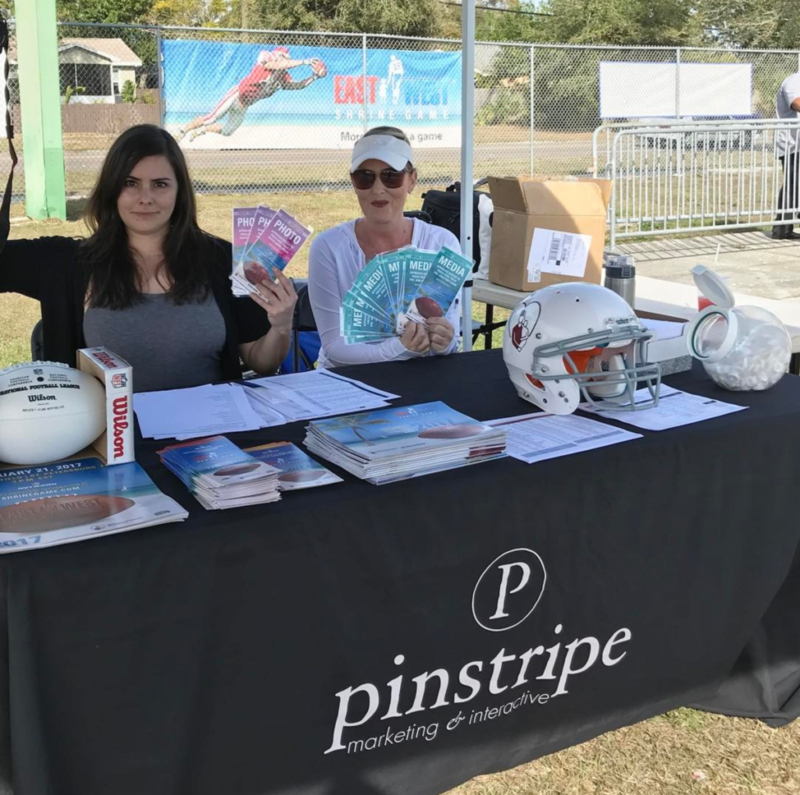 Saturday, January 21, 2017, marked the 92nd annual East-West Shrine Game and Pinstripe’s sixth year managing the advertising, social media, public relations, media credentials, pre-game and much more. While preparation for the game takes a couple months, the week leading up to it is an action packed time for us, and we love every moment of it! 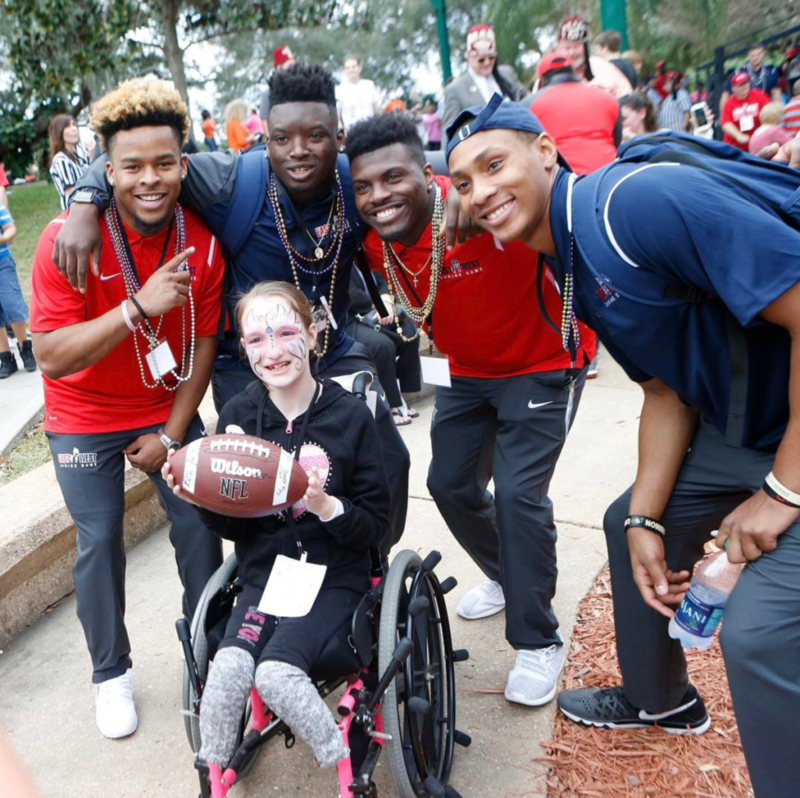 Kicking off the week with a visit to the Shriners Hospitals for Children – Tampa with four busloads of all-star football players, coaches, team managers and other staff is incredible. We couldn’t think of a better way to remind ourselves and these young rising star football players what the Shrine Game means. Monday am – We start the day by visiting the Game Office at the Tradewinds Hotel on St. Pete Beach. 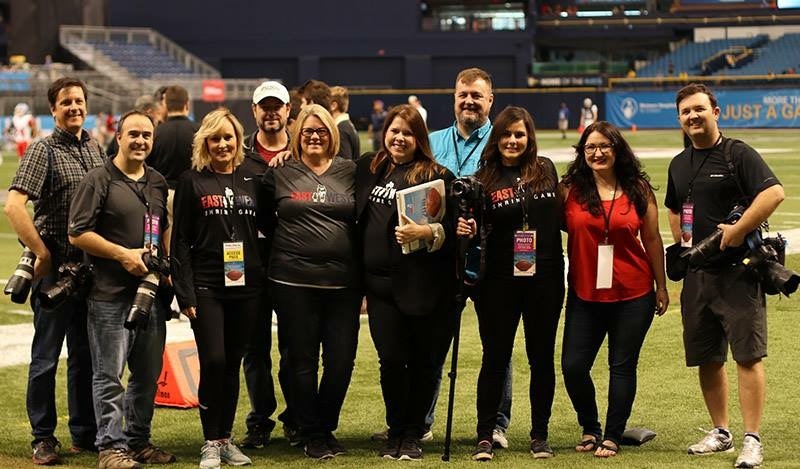 We check in with the staff there, pick up the most up to date rosters and practice schedules, and just say hi to all of our wonderful colleagues that make the Shrine Game possible. Monday lunch – We collect and organize all of our media interview requests for the players and coaches. These have been arriving via text, phone call, email – any method the press can connect with us, they do! Our goal is to make sure the press gets what they want, but also that the players get exposure for the week – they’ve worked hard to get here and deserve some recognition for that. Monday afternoon – Head over to Shorecrest Preparatory School football stadium, where the East Team practices. We set up our media table, where we distribute rosters, schedules, and check-in writers, photographers, and videographers who are approved for credentials to access the practice field and press box at the game. We even hand out mints and sunscreen, because we’re just thoughtful like that. You’d be surprised at how many people take advantage of both. We take photos and video of practice and post to all social accounts. After practice we pull players aside for in-person interviews with media, and give them instructions for radio and interview call-ins they will need to do in the evening. Later in the afternoon, we head over to St. Pete High football stadium for West Team practice, where we do the same thing that we did with the East Team. Monday night – We all meet to go over media requests, recap the last two days, look at photos/video, and make sure we’re on track for the rest of the week. The whole team is always checking in with each other to make sure all bases are covered and to see if anyone needs help with anything. 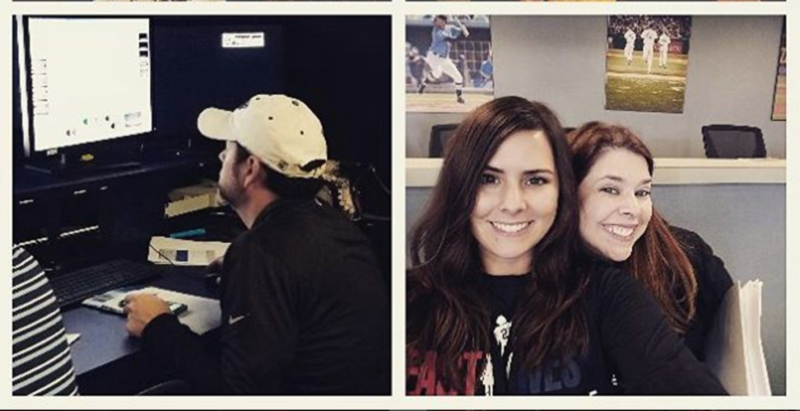 Tuesday – Thursday – These days are much like Monday – we attend practices, connect with media, and make sure that social is alive with photos, updates, and fun, interactive posts to keep our fans engaged and make sure they can follow what is going on. Some of the players’ families are not able to attend the game, so our posts are their way of seeing what is going on during the week. 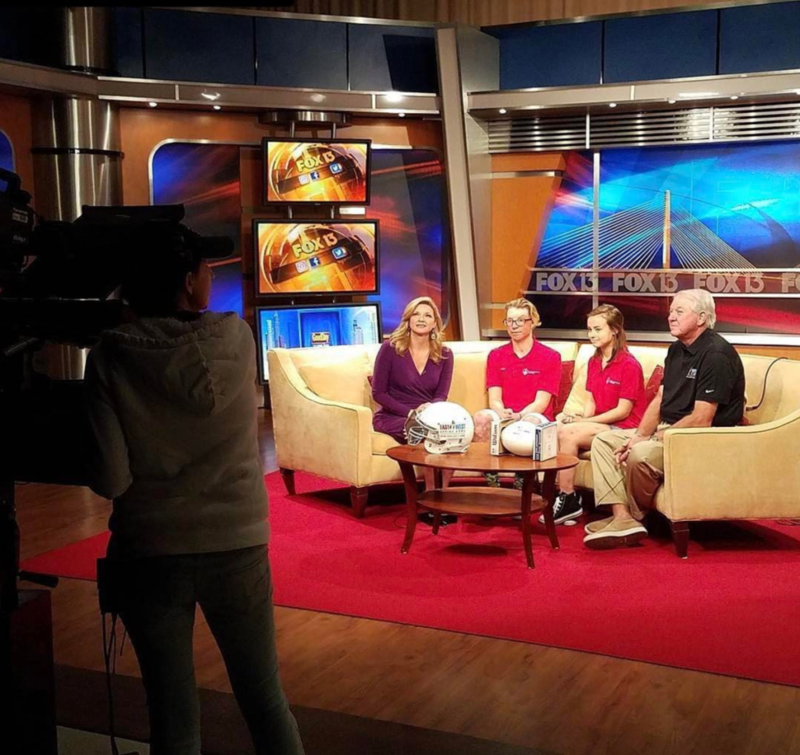 Thursday, Friday, Saturday mornings – Prior to the week, we booked morning shows for the executive director of the game and the Shriners Hospitals patient ambassadors, so we attend these morning shows for support and guidance, as well as to connect with the patient ambassadors. This is our first time meeting them and it is always a pleasure! Friday evening – We attend the banquet! The Shriners, players, coaches, and the Shrine Game team come together at Tropicana Field for a night filled with food, awards, and celebration. The executive director of the game, Harold Richardson, presents the Pat Tillman Award. Pat Tillman was a professional football player who walked away from the game after the terrorist attacks of September 11, 2001 to join the U.S. Army and fight for our country. After just three years in the NFL, Tillman turned down a multi-million dollar contract offer from the Cardinals to enlist in the U.S. Army. He was killed during a mission in Afghanistan in 2004. This year the award, which recognizes the player who best exemplifies character, intelligence, sportsmanship and service, went to Air Force safety, Weston Steelhammer. Saturday – GAME DAY! Although kickoff is at 1pm, the Pinstripe team is at The Trop at 10am to set up the press box, go through the production schedule with the Rays video team, and get ready to provide last-minute media credentials at will call. We manage the pre-game pageantry, in-game video and graphics, half-time show, sideline photography, press statistics, MVP voting, the final game press releases, and more! It feels like we fit a month of work into a single day that lasts well into the night. It is a tremendous sense of satisfaction as we look out over the dark, empty Tropicana Field where just a few hours before, a hundred young football stars burst onto the field to play for their futures, for their families, for many of their own reasons, but most of all, for the millions of Shriners Hospitals for Children patients who benefit from the game.